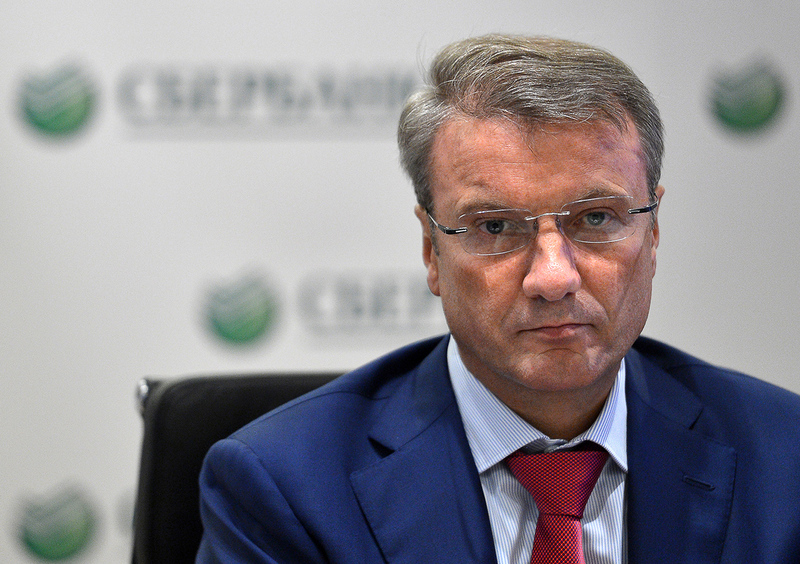 Russia's largest bank, Sberbank, faces corporate raiding lawsuit in U.S.
Sberbank president and chairman of the board German Gref gives a press briefing in Moscow. Russia’s largest savings bank, Sberbank, has been officially accused of hostile takeover charges in the U.S., according to documents from a New York State court obtained by TASS. Court documents show that U.S.-based PPF Management LLC filed a lawsuit in November with the United States District Court for the Southern District of New York against Sberbank, the bank’s CEO German Gref, as well as Promsvyazbank and a number of other Russian legal entities and individuals. Gref, however, responded to the charges by calling the lawsuit a "scam." "I believe this is a typical scam," Gref told RBC. "A lawsuit concerning an unpaid debt under Russian jurisdiction is filed in a New York court - this is clearly a PR stunt and a way to avoid responsibility." What is Sberbank accused of? The bank has been sued for $750 million - $500 million as compensation for business losses, and $250 million as compensation for moral damages. The lawsuit was filed on behalf of Sergey Poymanov and Irina Pogdornaya, the controlling shareholders in Pavlovskgranit, one of the largest granite producers in Europe. The plaintiffs accuse the defendants of conspiring "to take advantage of a market downturn" in order to conduct a hostile takeover of Pavlovskgranit. They also claim that the defendants tried to eliminate the company as a competitor. "While pretending to offer realistic restructuring options, they purposefully maneuvered Mr. Poymanov into a position where he was essentially trapped," according to the complaint. The document also said that Gref, "used his reputation and influence in the government to shield the defendants’ actions from the investigations and reviews of the Federal Anti-Monopoly Service." The list of defendants also includes: the NEO Centre Consulting Group and its vice president, Oleg Gref; Sberbank Capital and its CEO, Ashot Khachaturyants; co-owner of the National Non-Metallic Company, Yury Zhukov; and about twenty other companies and individuals. According to the complaint, Zhukov was the ringleader in the conspiracy. The statement claims the defendants conducted the operation covertly from Russian authorities. Pavlovskgranit's assets were put under Zhukov’s control. The defendants allegedly used offshore companies and proxies to exercise the takeover. U.S. banks were also involved and a part of the funds raised were invested in the United States. According to court records, the case file was closed to the public immediately after the lawsuit was filed. "Banking involves having to strongly protect one's interests, and I've researched the history of this affair," Gref told journalists. "We ended it in 2011-2012. The plaintiff was not paying its debts. We offered various options to restructure that debt, but the plaintiff tried to use contacts in the government, approaching all possible officials, trying to pressure us." Pavlovskgranit's story was reviewed by "all possible state agencies," - from the Accounting Chamber, to the State Duma and the presidential administration. "If we had been raiding after the 2008-2009 crisis, in terms of assets, the entire country would belong to us," Gref quipped. Before Gref's press conference, a Sberbank press officer told RBC that the bank acted lawfully in the Pavlovskgranit case and called Poymanov’s lawsuit an attempt to avoid responsibility. "The bank has information proving that Poymanov is trying to avoid responsibility, including criminal responsibility," said the Sberbank official. Why lawsuit in the U.S.? Fedor Kozlov, a managing partner at Fedor Kozlov & Associates in Chicago, said the lawsuit was filed in the U.S. for several reasons. "First, PPF Management LLC is a law firm that feels more confident in an American court," said Kozlov. "They have experience with cases involving banking in the post-Soviet landscape and in a Russian court their chances would not be as good as their opponents." Second, Pavlovskgranit is Europe's largest producer of non-metallic materials. This creates formal grounds for believing that the conflict's negative consequences have changed the situation on the American market, which gives the U.S. courts the right to use the principle of extraterritoriality. "Third, PPF understands very well that Sberbank is very careful with its foreign assets and the threat of a foreign court freezing them is a more significant blow for the bank than any decision coming from a Russian court," explained Kozlov. In addition, Kozlov remarked that from the viewpoint of Anglo-Saxon law, such lawsuits are normal. For example, British law allows a citizen of any country to file a lawsuit with the Royal Court. Only one condition must be met - the defendant must be summoned correctly. It’s for this reason that the lawsuit involving Boris Berezovsky and Roman Abramovich took place in London. The preliminary hearing is scheduled for April 20 in the New York County of Manhattan, and Judge Paul Gardephe will preside. According to court data, attorneys from several New York law firms will represent the defendant.